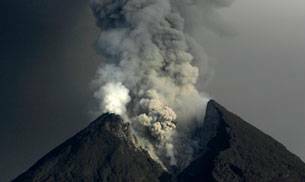 India's only live volcano in the Andaman and Nicobar islands which had started showing activity in 1991 after being dormant for over 150 years has once again started spewing ash, researchers at the Goa-based National Institute of Oceanography (NIO) said today. "The only live volcano in the Andaman and Nicobar islands is erupting once again. The Barren Island volcano, located 140-km north-east of Port Blair, dormant for more than 150 years started erupting in 1991 and has since then shown intermittent activity," CSIR-NIO said in a statement here. 1. A team of scientists led by Abhay Mudholkar, from CSIR-National Institute of Oceanography (CSIR-NIO) in Goa reported that the volcano is active and spewing smoke and lava once again. 2. "On the afternoon of January 23, 2017, the scientific team on board CSIR-NIOs research ship R V Sindhu Sankalp were busy collecting sea floor samples in the Andaman Basin near the Barren volcano when it suddenly started spewing ash," the NIO has said. 3. "The team moved about one mile from the volcano and began closely observing it. It was erupting in small episodes lasting about five to ten minutes," said the release. 4. During the daytime only ash clouds were observed. However, after sundown, the team observed red lava fountains spewing from the crater into the atmosphere and hot lava flows streaming down the slopes of the volcano, it said. 5. NIO has said the volcano was revisited in the early hours of January 26, 2017 again during the second leg of the cruise led by B Nagender Nath, it said, adding the team witnessed the continuation of spurts of blasts and smoke. 6. "They have sampled the sediments and water in the vicinity of the volcano and recovered coal-like black pyroclastic material representing proximal volcanic ejecta. Clouds were seen at the crater mouth where the smoke was bellowing out in otherwise clear sky," the researchers said. 7. These samples will help in deciphering the nature of the present and past volcanic activity in the region. 8. Researchers from CSIR-NIO have been studying the past volcanic events in Andaman Basin-based on the ash layers in a sediment column. 9. "The team observed the activity for about four hours before continuing with their research cruise. Landing on the volcanic island was not attempted as it was too dangerous," NIO has said. 10. The Andaman Basin is an active back-arc spreading basin and is known for its strong seismicity and many submarine volcanoes and hydrothermal activity. 11. Scientists from CSIR-NIO have been surveying the Andaman Basin and they have identified many small submerged volcanoes in a linear chain called a volcanic arc. 12. These volcanoes are formed due to the rising magma formed deep in the mantle due to the melting of the subducted Indian Ocean crust. 13. A few of these submarine volcanoes have been dredged for samples and pumice type of light volcanic rock have been recovered. 14. The volcanic island is uninhabited and the northern part of the island is, as the name suggests, barren and devoid of vegetation. 15. Private citizens of India can visit the volcanic island by chartered boats after obtaining permission of the Forest Department in Port Blair.